The National Healthcare CXO event is an invitation-only event held for approximately 90 attendees and is closed to the public. Delegates include CEOs, CAOs and COOs. The topics include: thoughts on the transformation of our healthcare system, cultivating a healthy hospital-physician relationship, quality measurement, techniques and redesigning the care process for improved results, patient satisfaction and experience programs to boost engagement and communication, and reducing costs by investing in outpatient care. Q&A: Should Case Managers Use PAM to Help Members With Self-Management? Meet RN Case Manager Turned Grief Coach Audrey Pellicano: "We Don't Grieve in Front of People, We Grieve Alone"
For advertising and sponsorship opportunities in the Disease Management Digest, please e-mail sales@hin.com or call 888-446-3530. (732) 449-4468,Fax (732) 449-4463; e-mail info@hin.com, Web site www.hin.com. 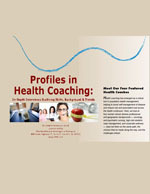 Complimentary e-book: Profiles in Health Coaching. Provides both a primer in population health management (PHM), identifying the challenges and opportunities of a robust PHM program, and an advanced case study in the use of analytics in PHM. Order your instant PDF download or print copy today. "Care management programs can improve the coordination of care for Medicare and Medicaid benefits, and can improve members' care and satisfaction." Watch the webinar today or order a training DVD or CD-ROM.